I said the same thing last year, but 2015 was our biggest year in travel yet. Four continents and 16 countries, about 75 cities, 11 United States National Parks, and a score or more Unesco World Heritage sites. We averaged four days per stop, which is not enough, and we’re not going to do that again, believe me. It’ll wear you out. That said, the most enjoyable part of any day was getting out the camera with the intention of trying to get that one evocative shot of where we were. Some days I was more successful than others. Here are 50 attempts at that. Like I also said last year, I hope you like them. Kris and I were staying in the Trastevere area of Rome, which is a long hike from the Vatican over the Janiculum Hill. We made the trek on New Year’s Day, but when we got to St. Peter’s, the line was more than an hour to get in. Kris bailed, but I stood in line, got in and made lots of exposures in the church. 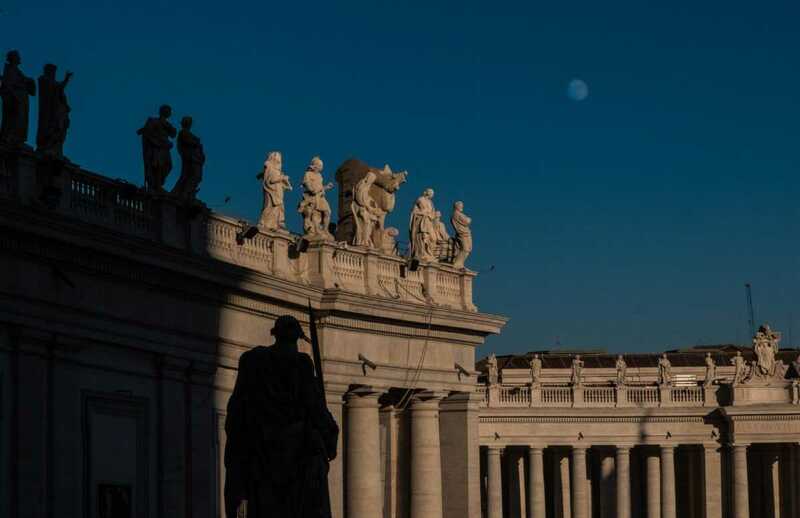 But when I came out the front door in the late afternoon, I saw the moon rising over the square. And I liked it better than anything I’d shot inside. In January, in my limited experience, I would say the weather in most of Israel is cloudy and windy and chilly. That’s what wet suits are for. 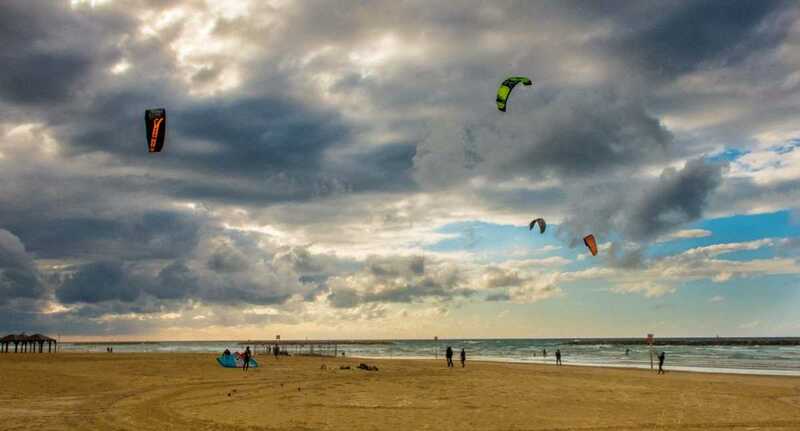 And the weather did not deter the dozens who were windsurfing on the beach just outside our hotel. 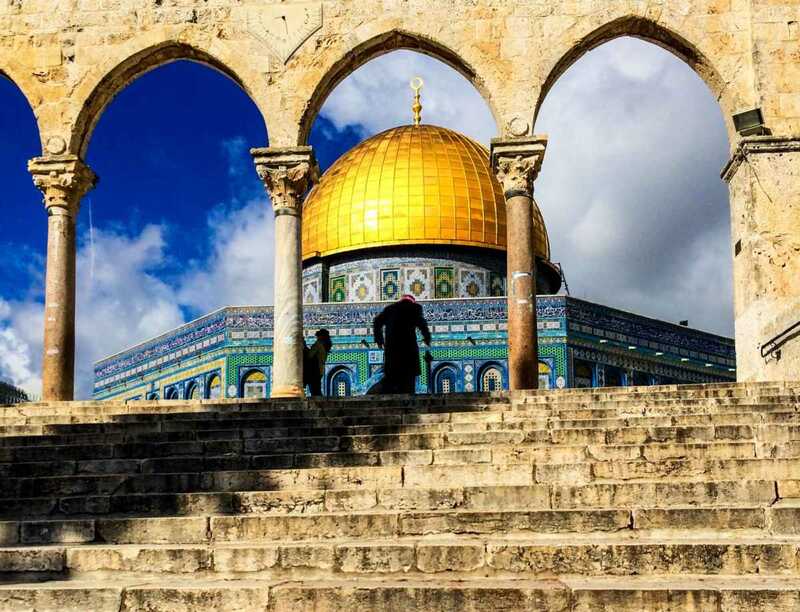 The Dome of the Rock, one of Islam’s most sacred sites, is closed to non-Muslims. It used to be open, but the Israelis closed some Jerusalem sites to Muslims, so, to reciprocate, the mosque was closed to everyone else, too. You can’t turn around in Jerusalem without running into the effects of ancient and modern hatred. Kris was very ill when we first got to Jerusalem, so I had to do my usual wandering alone. 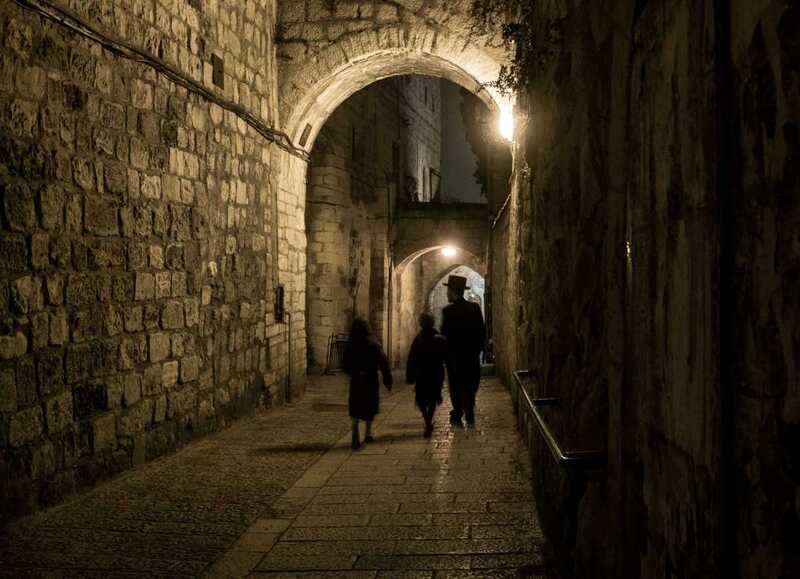 The Old City is a fascinating, and sometimes frightening, place to walk. The tension is palpable, especially at night. The city seems to close up and the streets empty out, except for this Orthodox family walking home as the dusk fell and the street lights came on. 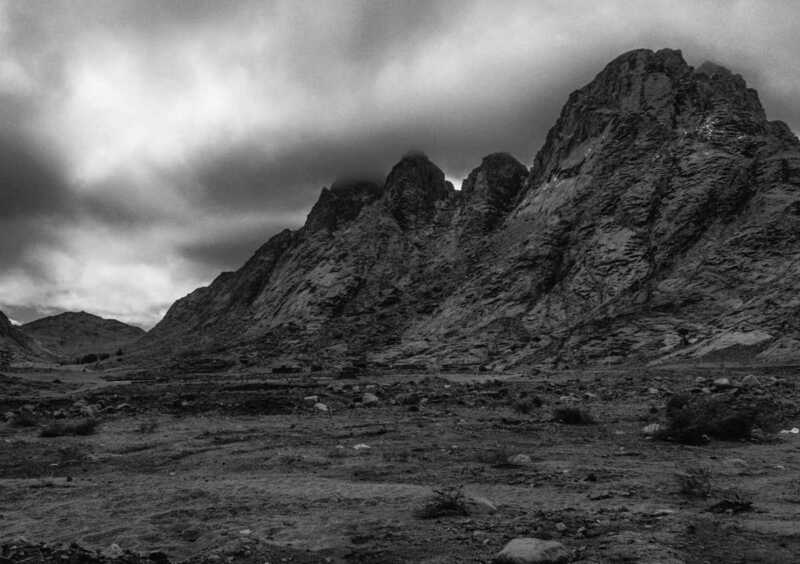 If you want to see Wadi Rum, the only way to do it is to hire the Bedouins who have exclusive rights to the site to drive you around. You can also pay them to feed you and put you up for the night in permanent encampments in various places in the desert. If you do the latter, you can set your smartphone alarm so you can get up before dawn and climb the high rocks above the camp and wait for the sun to come up. I highly recommend it. Bring a jacket, by the way, the desert is cold at night. Part of the service when you stay with the very hospitable Bedouins is a fire in the main tent. 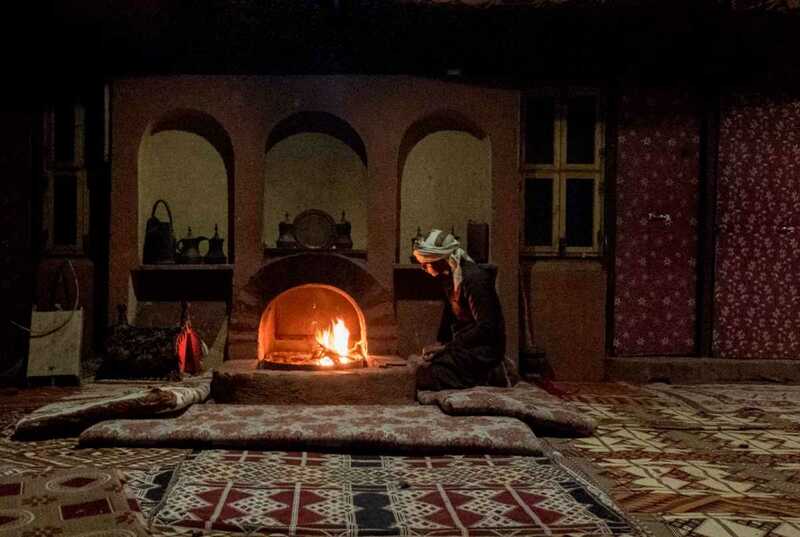 Very heavy woolen carpets make up the floor, walls, and ceiling of the tent, so the place is nice and cozy when the boy kindles a small fire in the stone hearth and serves you hot, sweet tea. 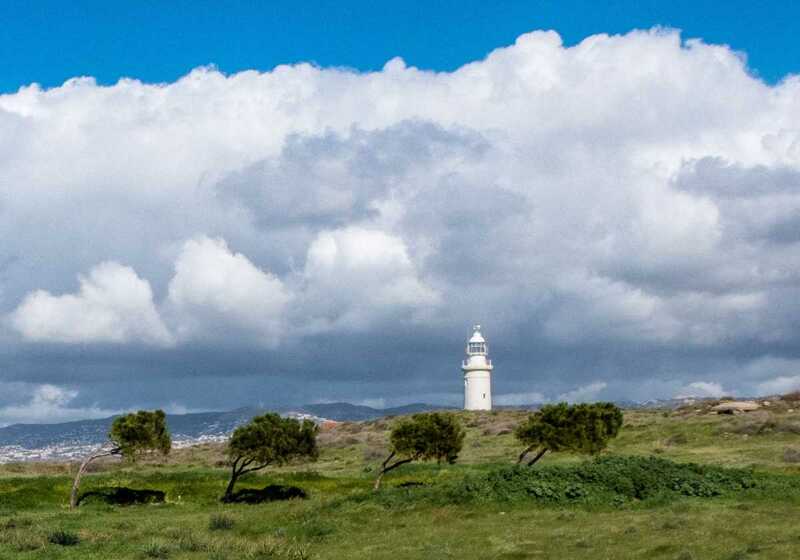 Cyprus is one of the oldest outposts of the Ancient Greek civilization, but as we walked among the impressively preserved ruins, what struck me most was the constant wind from the sea. That wind made most of the trees in the area look like bent over old men. This place isn’t easy to find. 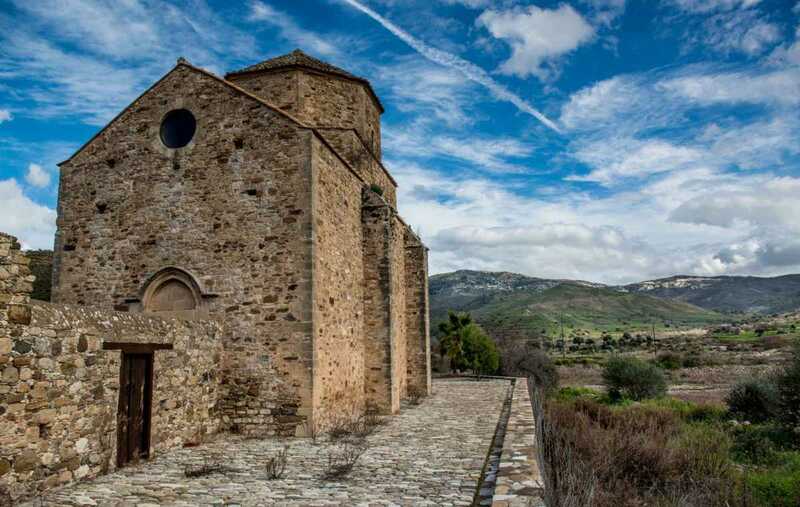 In fact, most of the Unesco World Heritage painted churches on Cyprus are tough to get to. This isn’t part of the World Heritage cluster, but we were close, and so drove 5 kilometers down an axle busting road to have a look. Malta, due to its proximity to both Europe and Africa, has historically been a coveted fortress that can control shipping lanes in the Mediterranean. Consequently, over the centuries, it was regularly raided and invaded by all sorts of pirates and foreign powers. 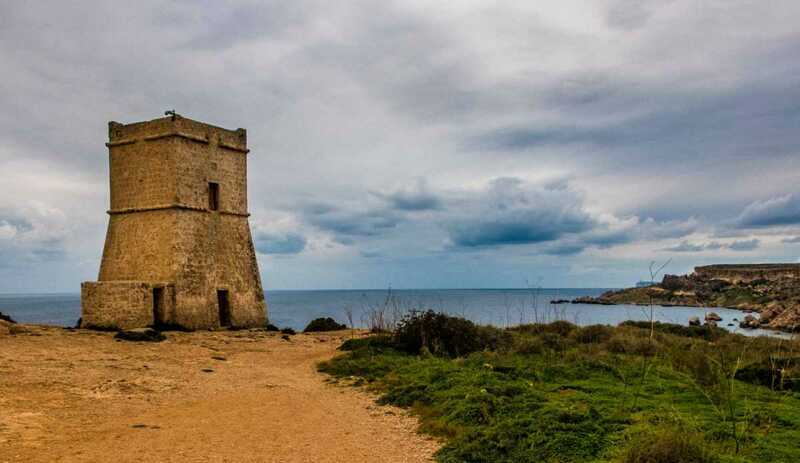 In the 16th Century, the Knights of Malta ringed the island with watchtowers like this one, all in sight of one another, so the alarm could be quickly transmitted all along the coast. 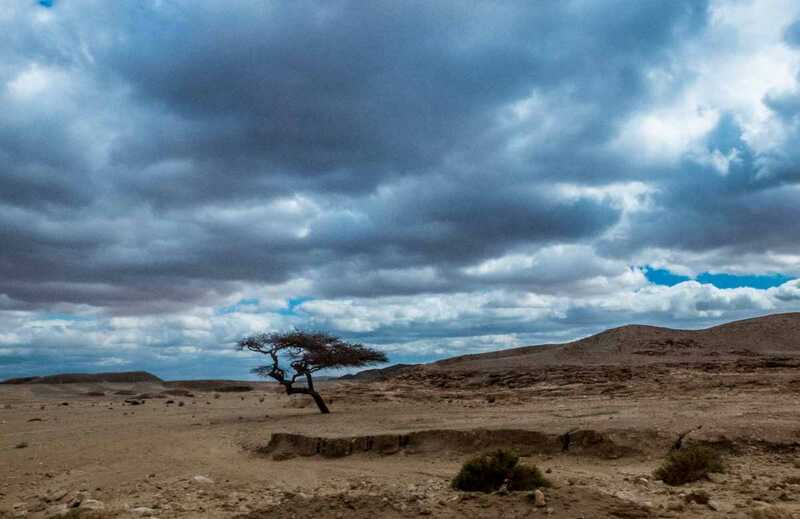 We spent a couple of days driving around the Sinai Desert. Or at least it seemed that way. A lot of long roads to desolate places, populated every 25 kilometers by Egyptian and UN military check points. At least it’s beautiful, as are all deserts. If you remember your Bible, there’s a story about this fellow Moses who went up a mountain and talked to a burning bush. He came down with some tablets inscribed with laws. According to the story, this is the mountain, which doesn’t look all that easy to climb, so I’m glad the guy got something for his effort. 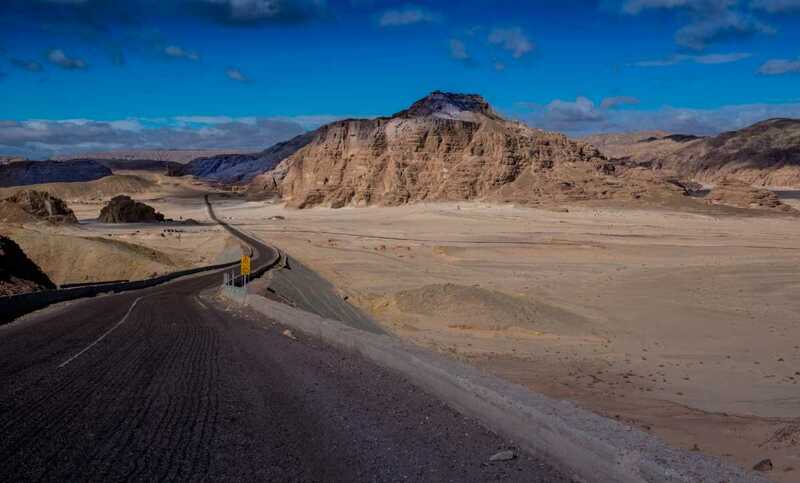 When you’re driving in the Sinai Desert, you don’t stop if you don’t have to. There are things out there that can hurt you, as we were reminded every time we stopped at an army checkpoint. So sometimes you just have to shoot out the car window as you blast down the road as fast as you can go. So that’s how you can get a photo of the very rare tree you run across now and then. We had the good fortune to take a Sonesta river cruise on the Nile. 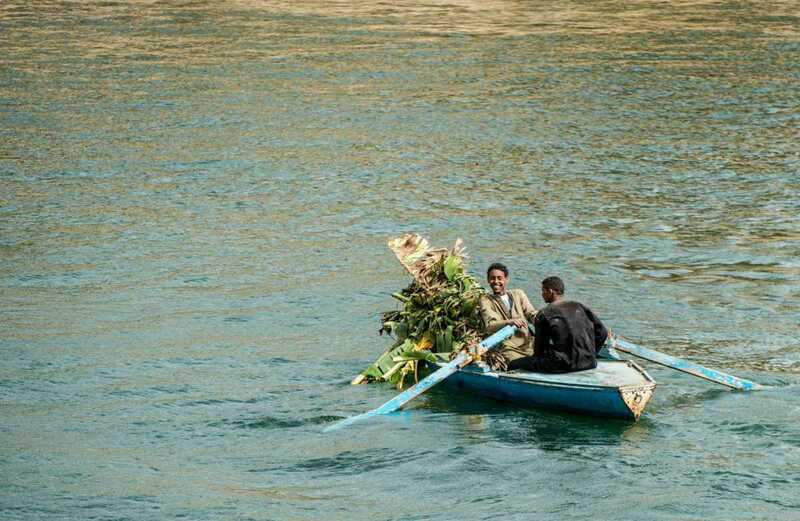 The river provides an infinite opportunity for shooting, even when you aren’t stopped at some fantastic Egyptian ruins. 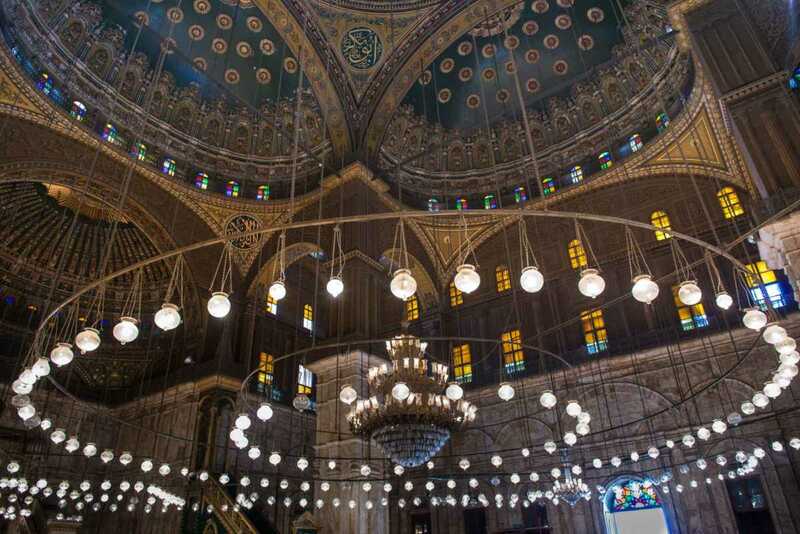 You can hardly visit Cairo without setting foot in at least one mosque. This one is the largest, and is relatively new. But, they did a nice job, and it is open to non believers. So there’s that. I could have made this whole post with just 50 shots from Egypt. But I won’t. All I’ll say about this shot is that we had to walk about a kilometer out into the desert to get this view. And that this is the photo of 2015 that would be most likely to end up on a postcard. One of my “Happy Places” is Las Vegas. 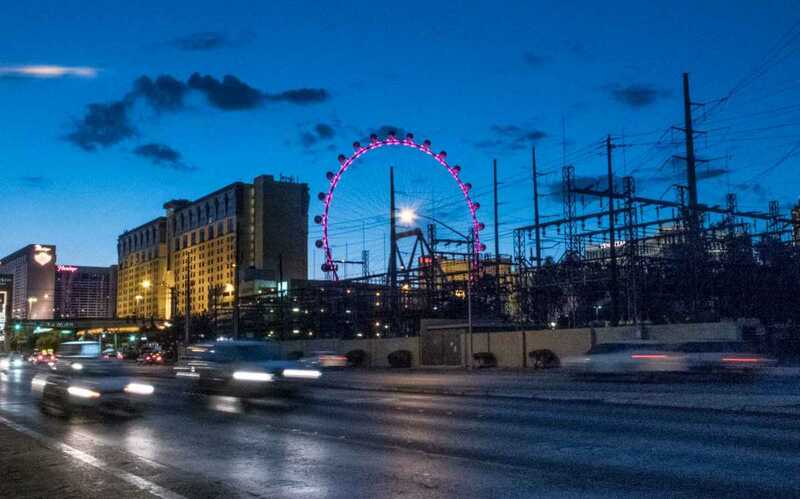 It’s pretty easy to get a beautifully composed shot looking down the Strip at all the neon. But I sometimes like to take walks down the cross streets just to get out of the crowds and get some exercise. And look at something else, like a big power station that runs all that neon. One of my other “Happy Places” is Barcelona. We lived there for a while in 1978, and we’ve visited at least a dozen times since then. It never ceases to enthrall me with it’s combination of the very old, the pretty old, the early 20th Century modern, and the new modern. 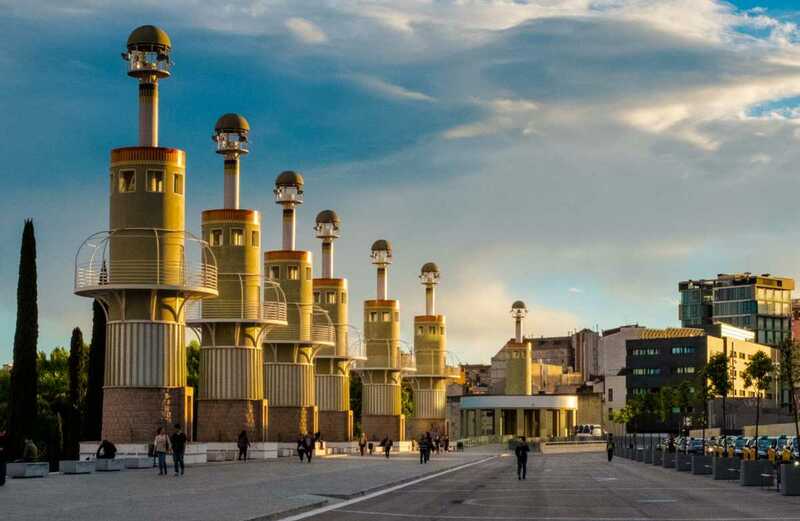 Like this new walking park in Sants, made from the remnants of an old factory. We first saw the Sagrada Familia when we went to Europe for the first time together in 1975. 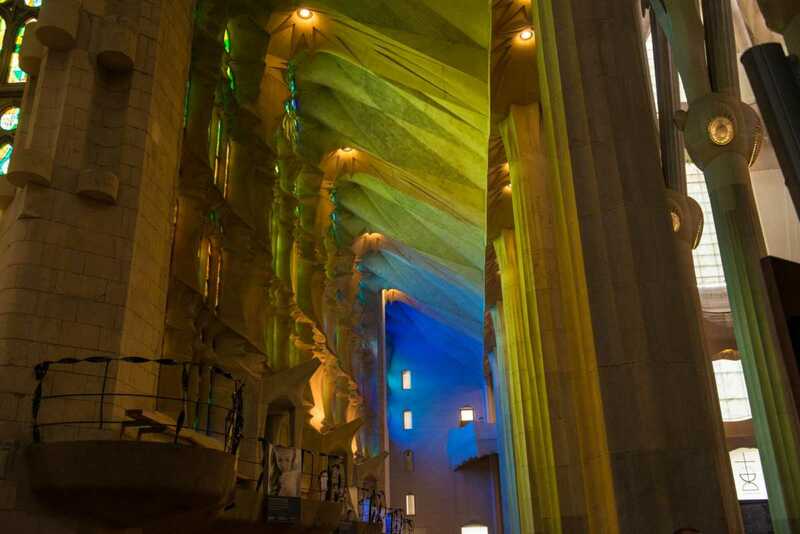 It’s come a long way since then, and has perhaps deviated some from Gaudi’s original concepts. That can be forgiven, of course, because the anarchists who controlled Barcelona during the Spanish Civil war destroyed all his plans and models. But they’ve mostly pieced those back together, and with the talents of many other brilliant architects, and the passage of time and money, the construction has continued now for more than 100 years. It’s supposed to be finished in 2016. Until then, there is still a lot to see. Especially when the sun pours through the new stained glass windows. 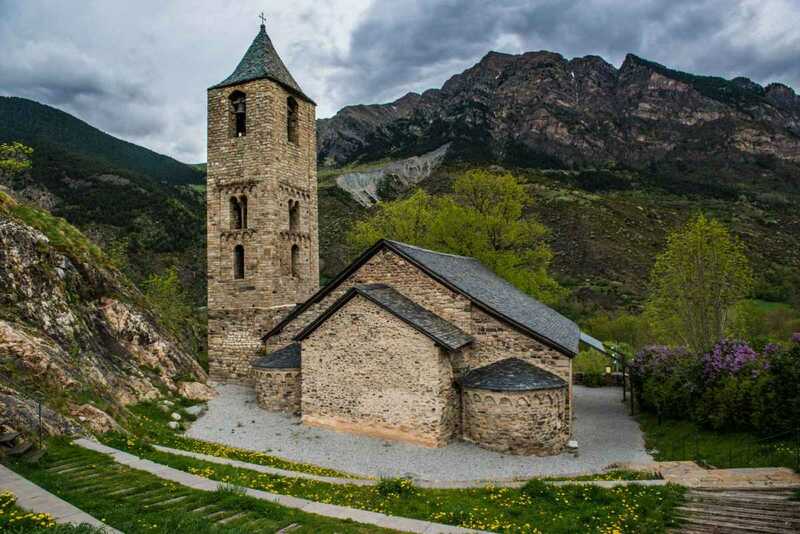 We were the guests of the tourism department for the province of Lleida, Spain. Honestly, it was a mixed blessing. We were herded on and off a bus for three days of madcap visits to all sorts of sites, including a nature park, a thrill ride park, and, my favorite, the Unesco World Heritage collection of 10th-13th Century churches. Unfortunately, I forgot to note the name of this one. We visited several. It was one of those. 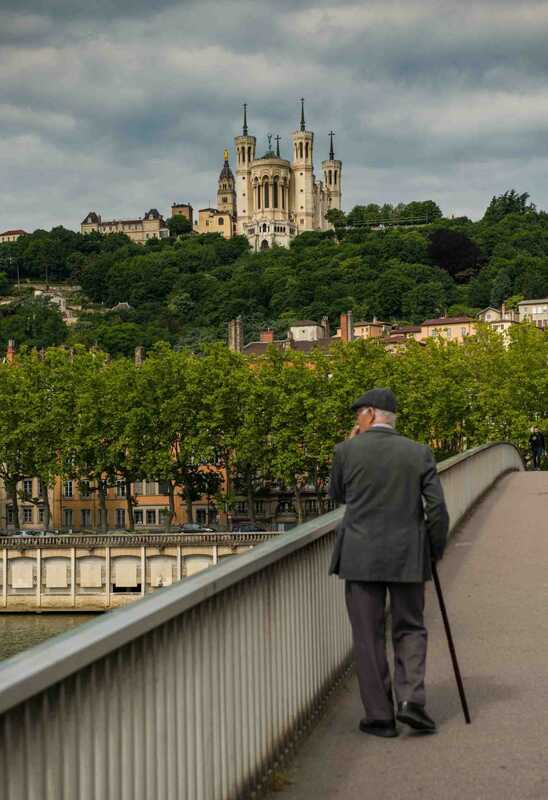 Our second river cruise of the year was with Viking River Cruises from Avignon up and down the Rhone to Arles and Beaune. 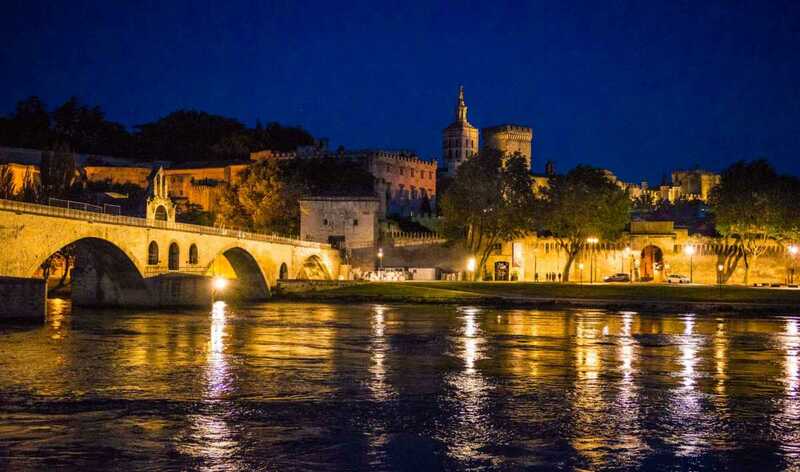 The first night on the boat we got this lovely view of old Avignon and its bridge, which doesn’t actually cross the river. I’m not sure why, but if you want, you could look it up. One of the other reasons we said we could live in Lyon is that it’s in Burgundy. 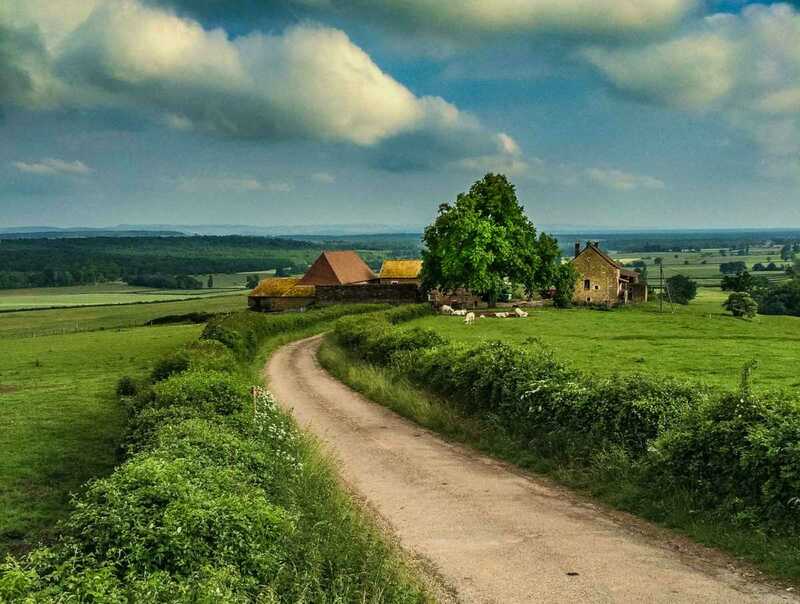 And the Burgundy country side looks like this. And, they have wine. Really good wine. I’m sort of proud of this pic because it was shot out of a bus window, with my phone. Proving again that you don’t need to lug all that equipment all the time. Or that you don’t need to reach under the bus seat to drag it out if you see something. We visited Ávila very briefly when we lived in Spain in the 70s. But for some reason, I don’t remember going into the cathedral. I’m sure I would have remembered, because this variegated red stone used to build it is distinctive. And beautiful. 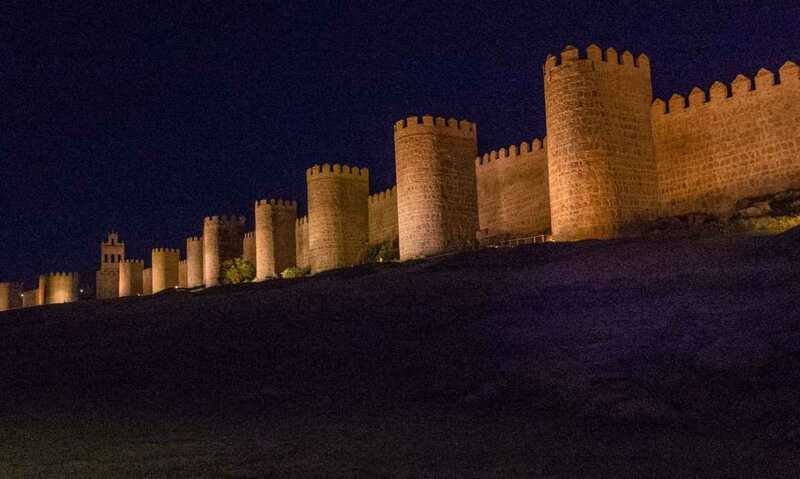 The iconic walls of Ávila. We walked all the way around them as the sun set one evening. It was dark by the time we’d done the four kilometer walk. And I think these walls are best seen at night. 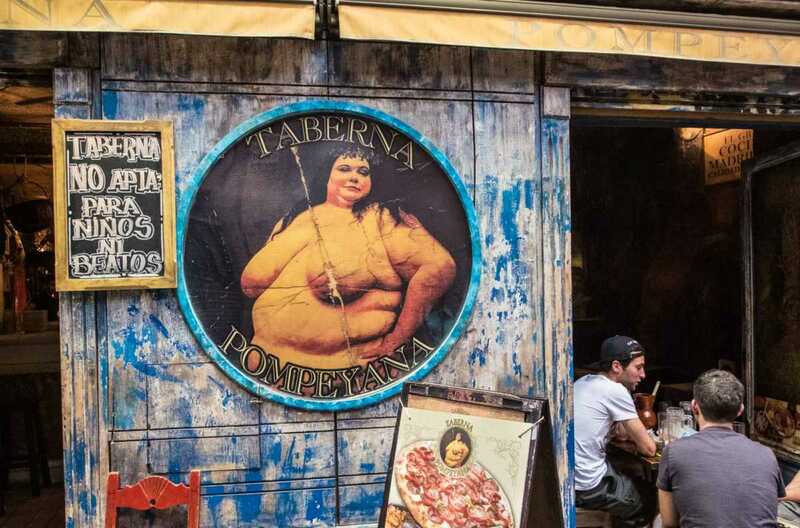 Just so you don’t think we spend all our time in churches, I include this shot of the Taberna Pompeyana in Madrid. We stopped here long enough to confirm the legend on the chalkboard was true. It says, “This tavern is not appropriate for children or the devout.” God, I love Madrid. 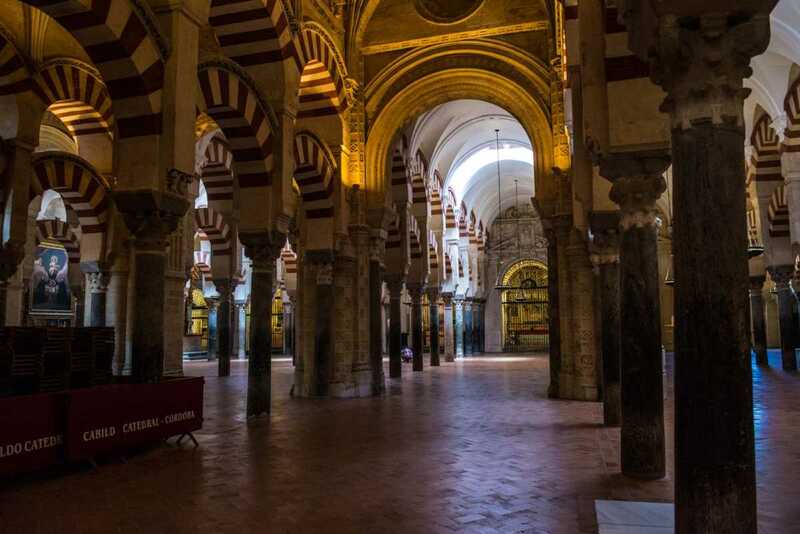 It’s not that we didn’t spend some time in taverns in Córdoba, but you kind of have to see the size and simple beauty of the Mosque in Córdoba to get the full Andalusian experience. The Christians kind of junked the place up by putting a church in the middle of it, but enough of the original was preserved so you get the idea of what it used to look like. We were lucky to be in Córdoba at the time of their annual “White Night” festival, where you stay up all night and go to various venues in the city to see the authentic Flamenco singing and dancing. This is the real stuff, and, we were among the very few tourists who were there. It’s quite different from the lower energy shows put on for the tourists that start at 8 p.m. To see this in Sevilla, Granada or Córdoba, you have to be willing to stay up all night. It’s worth it. There are a million photo spots in the Alhambra, and nearly as many stories. 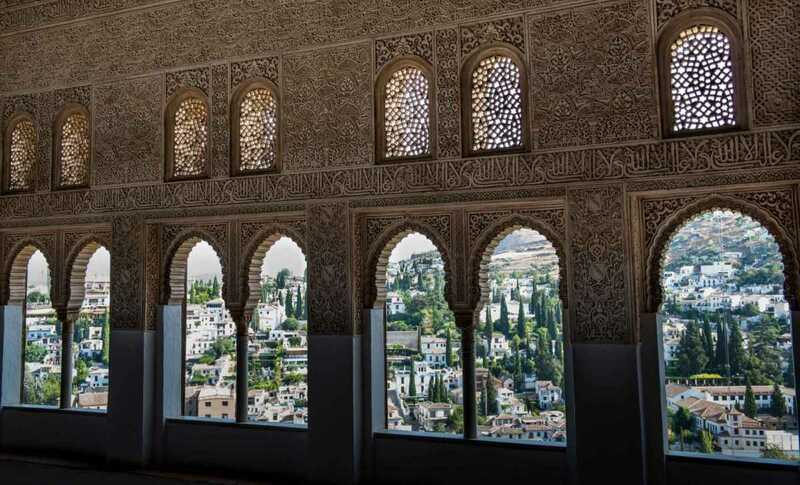 When we first came to Granada 40 years ago, I picked up a copy of Washington Irving’s Tales of the Alhambra in one of the ubiquitous Granada gift shops. I like to imagine Irving walking in this gallery as he composed those stories in his mind. One of the wackiest features of any cathedral we’ve visited is this hole cut in the ceiling of the immense Toledo church. 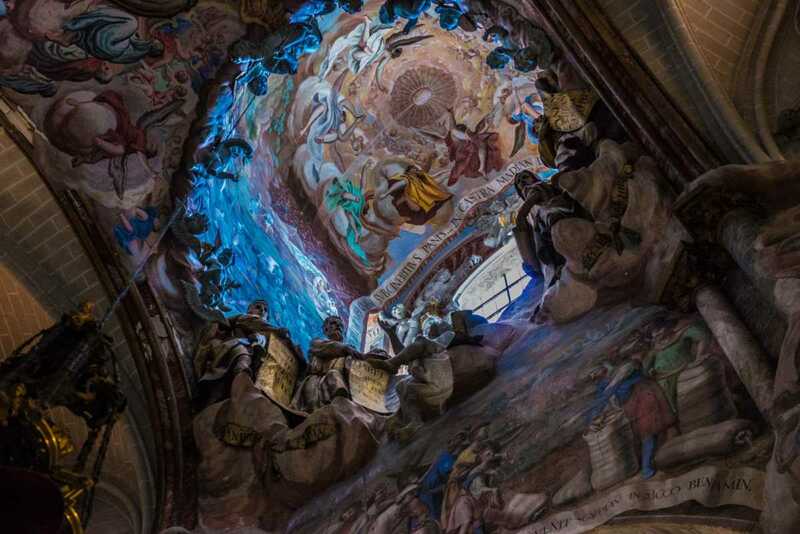 The baroque sculpture starts on the floor and swirls its way in perspective through the hole, where it turns into painting, and then goes all the way to heaven. So they say. This isn’t exactly the same as touring the decorated churches of Europe, but we ran across this museum as we were driving through Iowa. It’s an eclectic combination of the sublime to the ridiculous. It showcases some nice bits of woodwork and architecture cadged from old American churches, and some excellent original art from a Holocaust survivor. 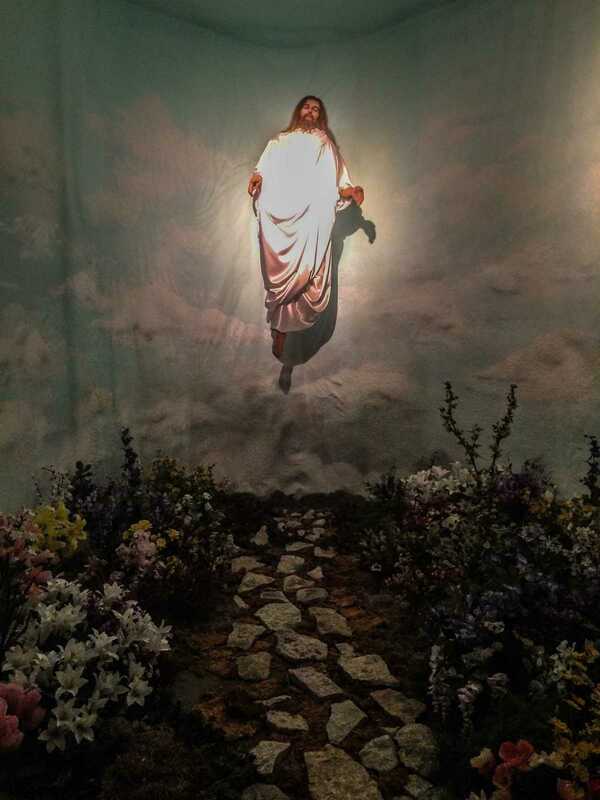 But there’s also a healthy dose of kitsch, such as the collection of nun dolls, and a wax museum display of the life of Jesus. I went for a walk toward the river from our son’s apartment. 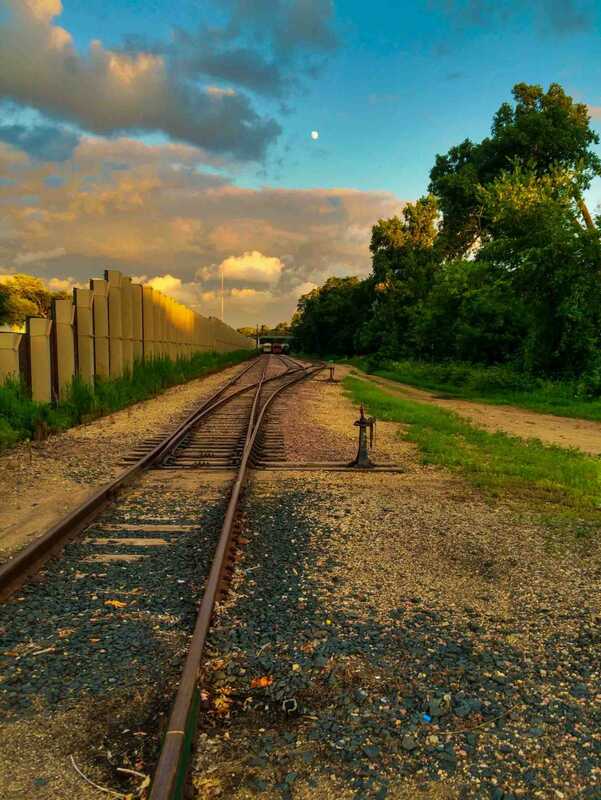 The sun was setting as I ran across this mostly abandoned spur where they park unused railroad cars. Another time I was lucky my phone has a camera. We started driving west from Minneapolis in early August with the idea of visiting a lot of the National Parks we missed last year. 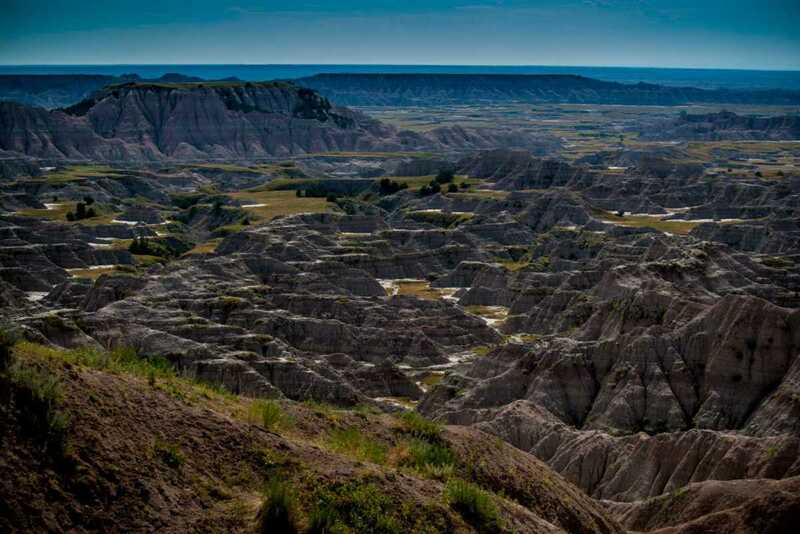 The first one was the Badlands in neighboring South Dakota. It’s not called the Badlands for nothing. Stark, sere beauty. As you followers know, we tend to visit a lot of historical battlefields. This is one of my favorites. The Battlefield stretches over miles. You can drive to various locations in your car, and then get out and walk on guided paths through the prairie killing ground. 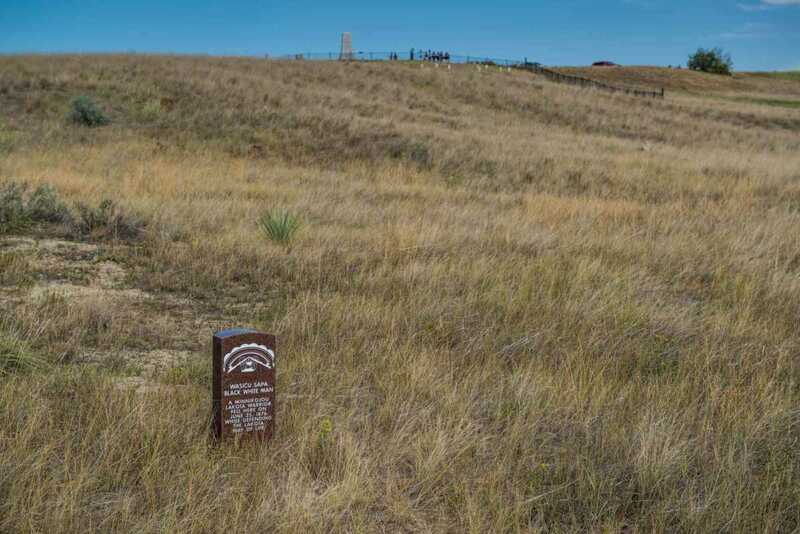 White headstones mark where Custer’s soldiers and their Indian scouts fell. Red stones mark where Indians fell. If you go, be sure to listen to the Ranger talk. As always, the US Park Service Rangers are excellent at their job of explaining history to the tourists. Skip the Crow Indian tour. It was awful. We were driving through Glacier National Park after spending all the day hiking through dry, burnt, and glacier-less country. 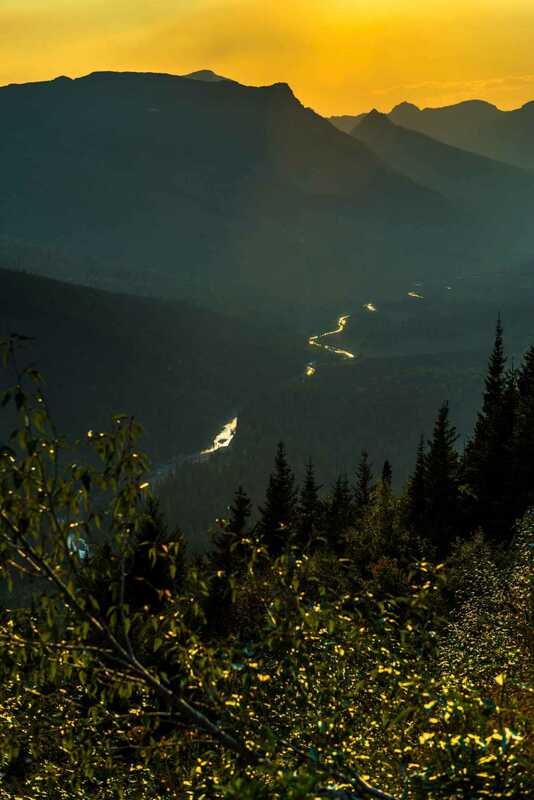 So we were a little discouraged until we came over a rise and saw the sun glinting off the river below. There was not much water flowing. But there was enough. 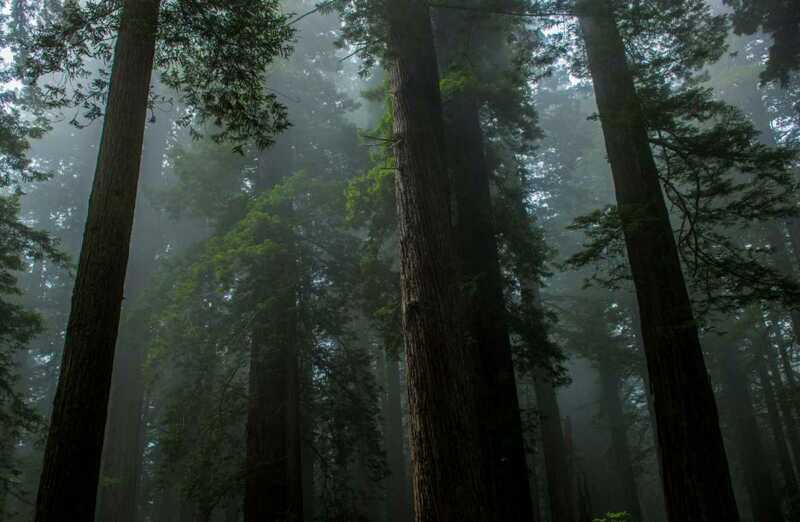 When we got to the Pacific Coast, there was a little moisture, some fog, and even a day of rain. Which was very welcome contrast to the parched West, and to the burning landscape that stretched from South Dakota through Montana, Idaho and Eastern Washington. The air was clear of smoke, and the mountains in the distance made a beautiful backdrop to our hike. The fog along the road was nearly a constant for the few days we spent here, and it made for some beautiful shots of the light filtering through the trees. 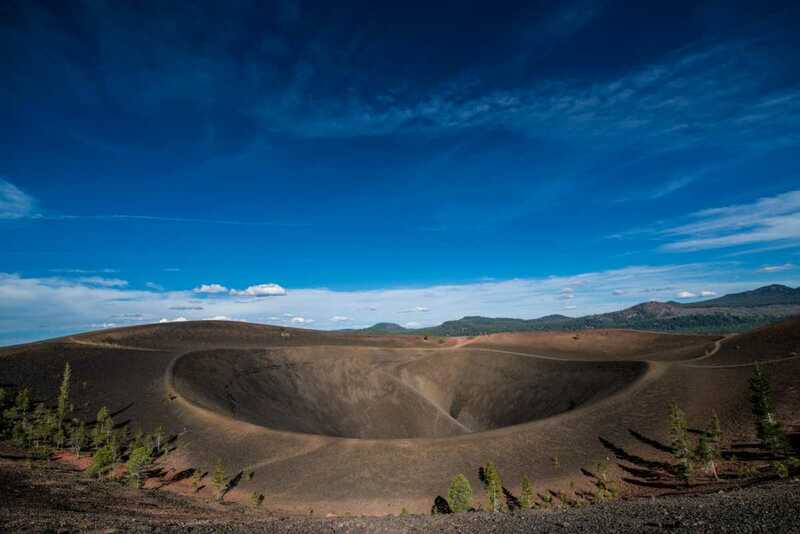 All I’m going to say about this shot is that I had to climb a volcanic mountain through ankle deep ash to get it. It is kind of cool though. 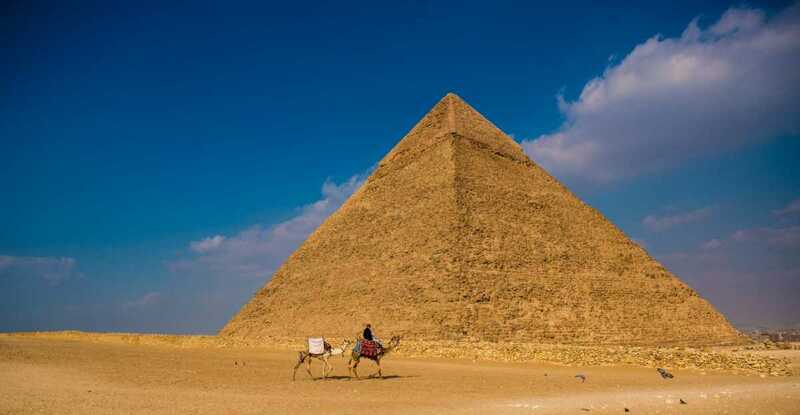 The cone was formed only a few hundred years ago. Just long enough for some trees to begin to spring up around the perimeter. The area on the sides and below the cone pretty much look like the moon. I, and about 100 other people, got a similar shot to this one this afternoon. It’s just that there are icons in Yosemite and you have to shoot them. To get the best shots of Yosemite, I think you’d have to live there for at least a year and shoot every day in differing conditions. That strategy worked for Ansel Adams. 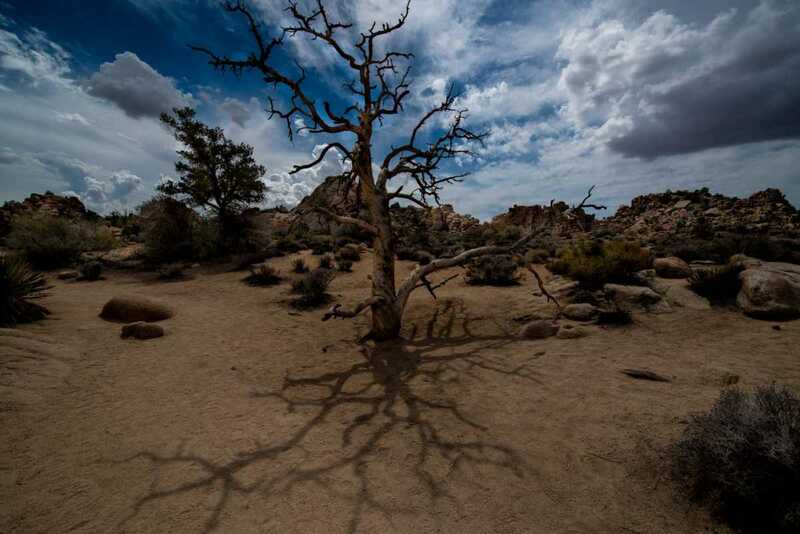 Unlike the shot above, I’m pretty sure I’m only one of two people who got this shot in Joshua Tree. We got to Keys Overlook just as the sun was dipping into the clouds. I rushed to set up my tripod and luckily was ready when this happened. This light lasted only about a minute. And I was lucky enough to be there for it. 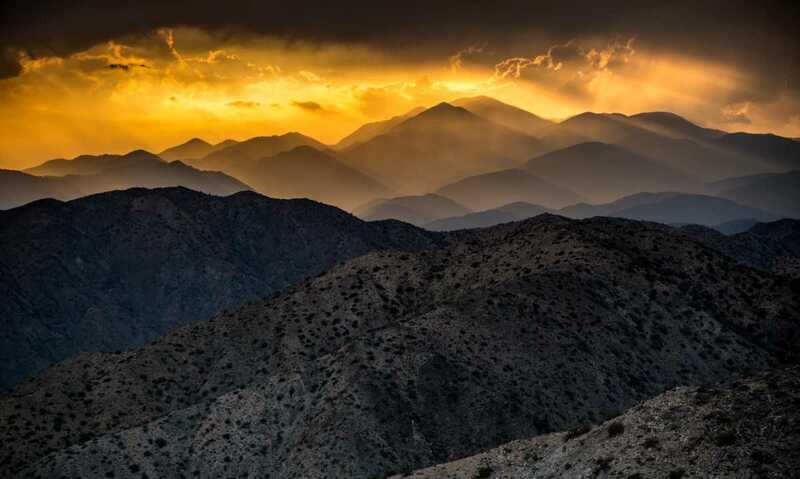 This shot was an Editors’ Pick in the National Geographic annual photo contest. As I was walking down the hill from where I shot the photo above, the light was still showing off a bit in the west, so I dropped the tripod, swung the camera up, and took one last shot of the day. 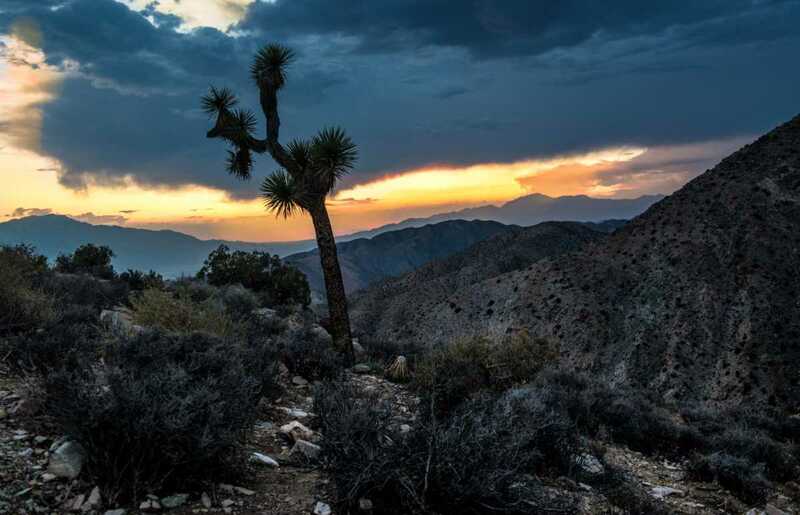 That’s a Joshua Tree, by the way. Part of the legend of the Old West is that 19th Century cattle rustlers used to use Hidden Canyon to hide their herds from the ranchers they’d stolen them from. But a landslide or two which blocked easy access, over grazing, and the recent drought in the west has turned the canyon floor into a desert not unlike the land all around it. Lots of dead trees. 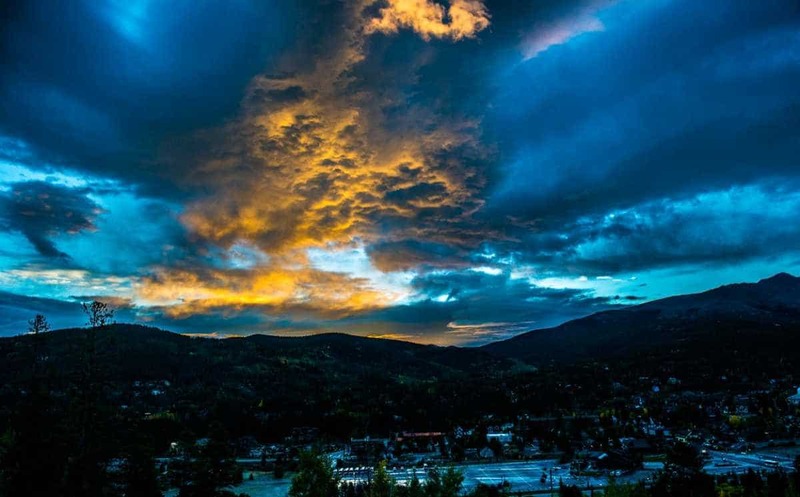 We took a break from our driving tour of the West to fly into Denver and then drive up to the lovely mountain town of Breckenridge to do a little work for Breckenridge Tourism. I could say a lot of very nice things about Breckenridge, not the least of which is its importance in the history of the American West. But then, there’s just a lot of spectacular natural beauty to go along with its interesting past. That combination is hard to beat. We took another break from our driving tour of the West to fly into San Francisco for the wedding of a couple of old friends. As part of the post ceremony party, I was shanghaied onto a boat tour of the bay. Normally, I hate boats. Especially boats bobbing on a rough sea. But I grinned and bore it. And got a couple of nice shots between the times I was leaning over the rail wondering if I was going to vomit. 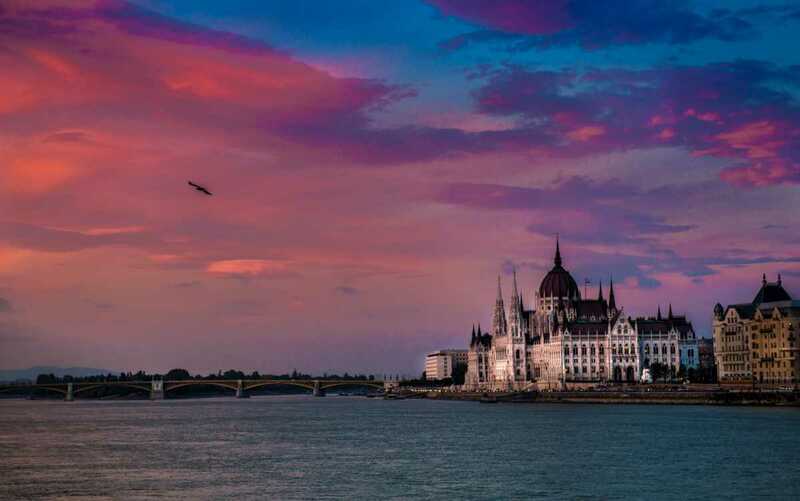 The entire Danube waterfront in Budapest is a Unesco World Heritage site. Because it’s just that beautiful. The other side of the Danube from the Pest landmarks are the Buda hills which afford the views like the photo of Parliament. 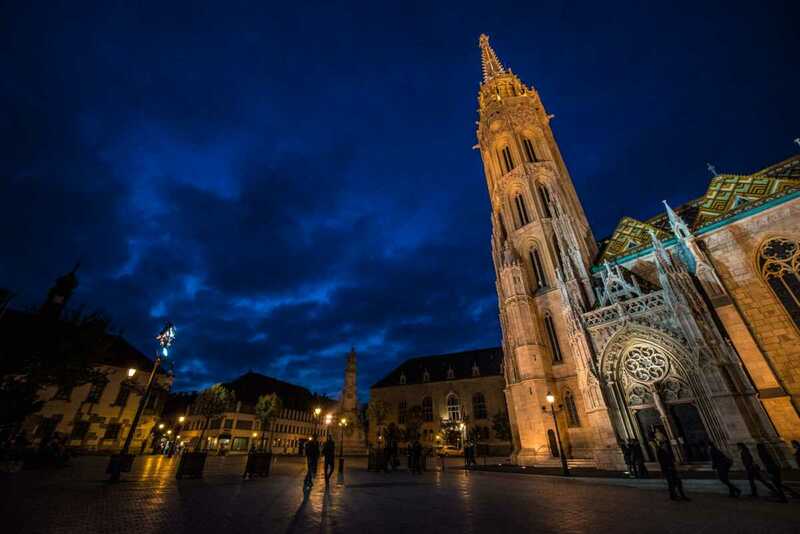 But the Buda castle area has its own attractions, such as the spectacular Matthias Church. The inside is one of the most remarkable works of church art I’ve even seen. I did an entire post about it. But after spending hours shooting inside I sat to rest on a park bench in the plaza and watched the sky turn and the walkers come out. 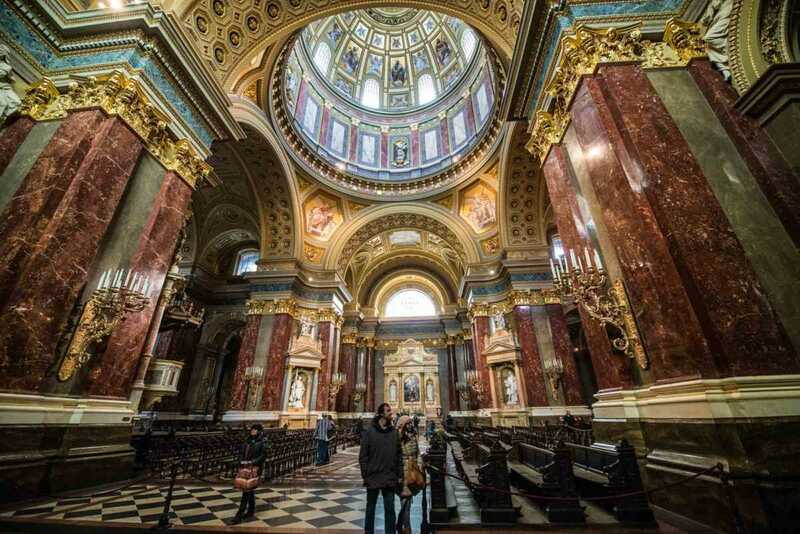 The other remarkable church in Budapest is Saint Stephen’s. It’s a neo-classical masterpiece, with a little baroque thrown in for good measure. 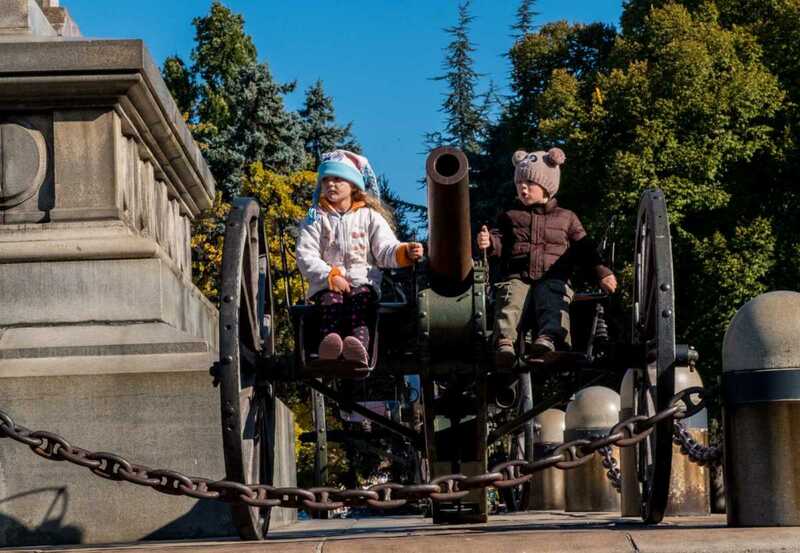 Ok, who doesn’t want to sit on a cannon? Even at my age? The boy was saying “Boom! Boom! Boom!” Or the Bulgarian equivalent. Another fantastic German cathedral, which luckily mostly survived World War II. 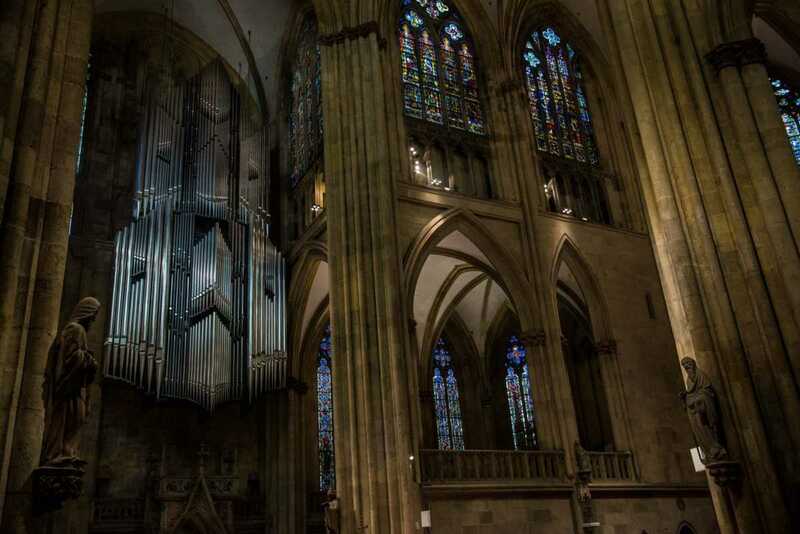 The organ sounds pretty good, too, as we found as we arrived during Sunday mass. There’s something about fog that just makes for interesting pictures. Don’t you think? 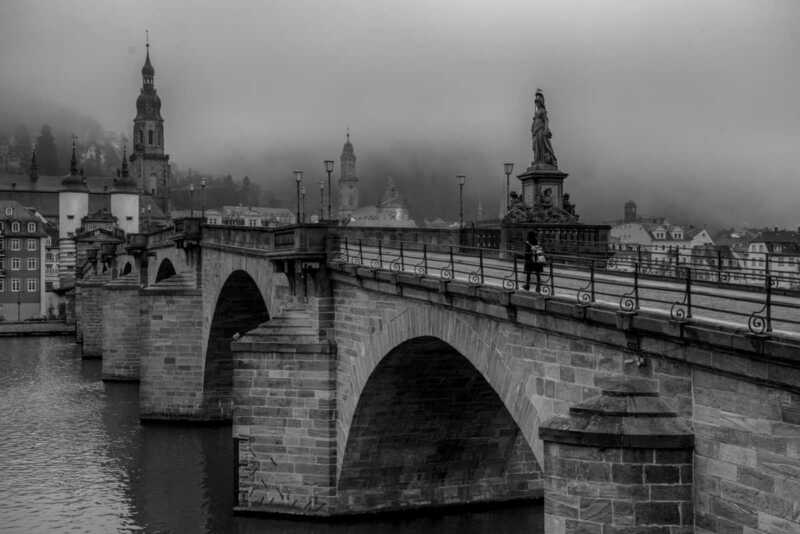 I got up early and walked about four kilometers through Heidelberg just to get a look at this bridge and the old city before the fog lifted. 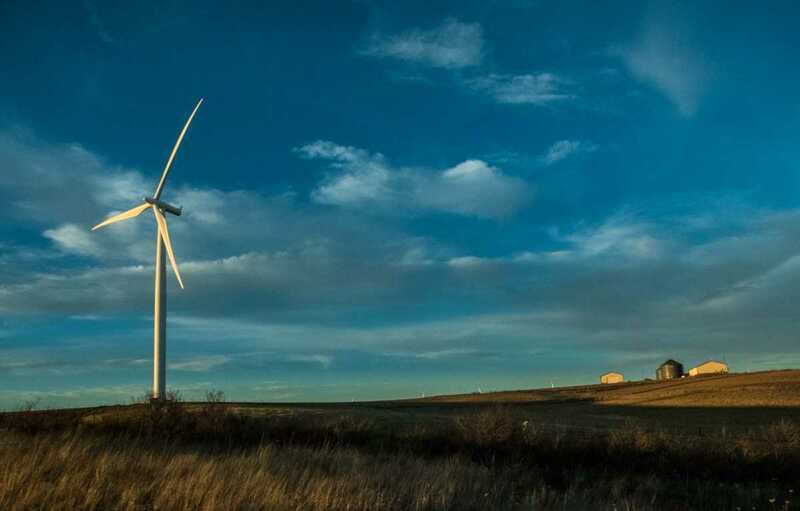 Iowa is my home state, and we shuttle often between our erstwhile home in Minneapolis, where our children live, and Council Bluffs, Iowa, where we visit my mother. People ask me all the time, “Doesn’t that drive bore you to death?” Not really. I think Iowa is beautiful. Those are amazing photos! You captured life! Hope we could visit some of these places someday. Thank you very much. As for visiting them, you just have to make up your mind to go. And then be crazy enough to actually do it. I don’t recommend 14 countries per year, though. It’s exhausting. Been to many of the places in your photos, so it was fun to revisit. Going to Budapest in April. Can’t wait. Awesome idea! And the photos are gorgeous! Here’s to 2016! Thanks, Joe. And, yes, 2015 is going to be hard to top. In 2016 we’ll just have to work harder. I made a similar comment about the Mezquita in another post once, (that the Christians sort of ruined it.) There was a Spaniard who took issue with that, which, knowing Spain as we do, was not surprising. 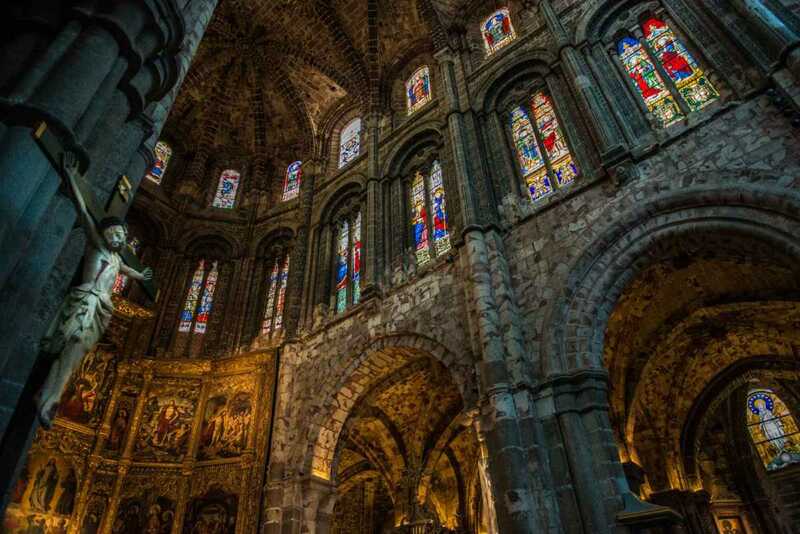 There are so many great cathedrals in Spain: Toledo, Sevilla, Leon, Burgos, Barcelona. This, however, is not one of the good ones. Second rate all the way, especially when compared to its surroundings. Gorgeous photos! What a year! I’m inspired. Thanks, Cindy. If I can get just one person to get up and go, my work is done. Thanks, Emily. Everybody has to have a home. It would be good if it were Colorado. Sign me up for your next (first?) Photography for Bloggers course. Your photos make me feel terribly ashamed of my feeble efforts with my phone camera. Probably, your first piece of advice would be, “Get a real camera.” It must have taken hours for you to choose which photos to include here—a really beautiful post. It ain’t the camera, Suzanne. A couple of these were taken with my phone. And a couple others of my favorites over the years were taken with what could probably be called a “point and shoot.” And, I have thought of doing a course. Do you think anyone would really come? Tom, Gorgeous shots! You went to some amazing places, and it certainly looks like you had a fantastic time! I’m not sure I can pick a favorite, but I am really partial to a great sky, and you have plenty of those! Thanks, again, Corinne. I’m sort of partial to the sky, too. It frames mountains and buildings so well. And, all you have to do it wait for it to happen. What a great set of masterfully taken and post-processed photos! You have just inspired me to do the same from our 16 countries and 8 states/provinces travel destinations in 2015! Thanks so much Carol. Be sure to let us know when you do. I’d love to see them. Wow, what a great a great recap of the year! Looks like you had a fantastic 2015, here’s hoping 2016 is just as good… or better. We’re hoping the same. So far, so good. What an amazing year you had! I liked seeing a mixture of places I knew and ones I haven’t seen (yet!) like the American national parks. I particularly liked the picture of the old town of Jerusalem – I was there about 40 years ago, and that’s exactly how I remember it. Thanks, Karen. 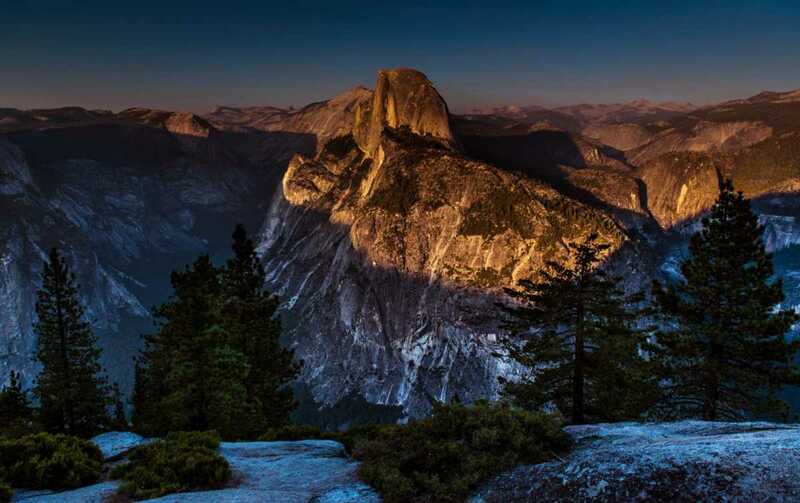 Our National Parks are probably the best idea America ever had. Well worth the long drives to get there. We’ve now done most of the ones in the West, but there are lots we haven’t seen, too. On to the East this year and next probably. Beautiful photos. You have had a pretty wonderful year of travel. And I like that you still find the Iowa drive beautiful. We often miss the beauty in the familiar. Happy travels in 2016. Thanks, Donna. We do indeed forget to look at home, sort of like Dorothy before she clicked the ruby slippers. Great pics! Love traveling with you through your photos and stories. If you’re ever in the Four Corners area let me know… I’d love to catch up and share some more incredible National Parks of the SW with you! Happy Travels! Thanks, Carol. We will have to take you up on that. It’s been a long time since we met in Belize. Would love to see you again. First, let me say your photos were amazing! So smart to make them take up the width of the page! I keep seeing/reading about Wadi Rum and think it’s calling for me! I think next year I’ll have to steal your idea and do a summary of my trip photos. Thanks for sharing……has given me lots of future trip ideas. Thanks, Janice. 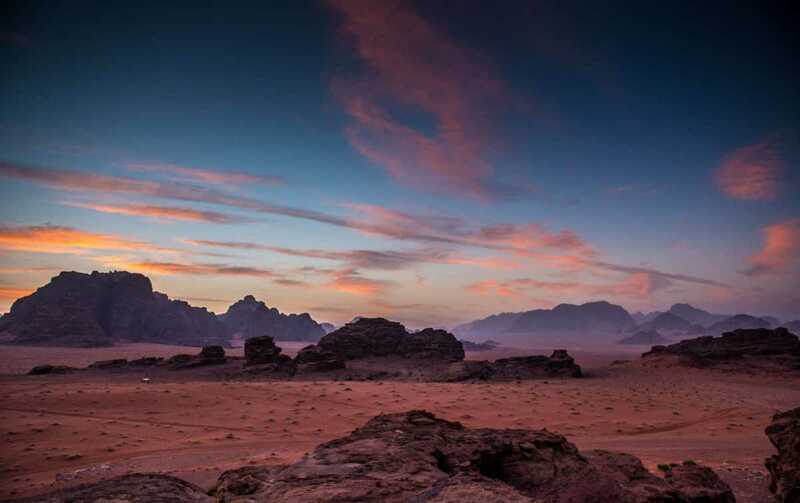 And Wadi Rum is incredible, as is all of Jordan. Don’t miss Petra, of course, and Jerash. 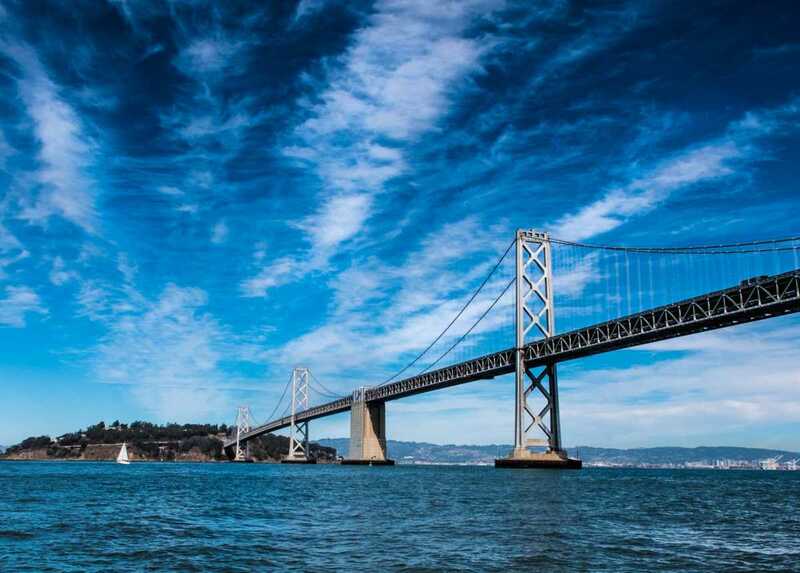 Your photos are stunning, you certainly did get around in 2015! Thanks Nathalie. Now we just have to decide what to do in 2016. Thanks a lot, Irene. It did take the better part of the day. But most of the photos were edited already because they’d been in posts throughout the year. This year, I’m going to collect them in a folder as I go. My goodness, what an impressive portfolio for 2015! I especially love the photo compositions with the shadowy figures. So different from what we normally see. St. Peter’s Square and the Dome of the Rock in Jerusalem were standouts! Thanks so much Alison. I like those two shots as well.